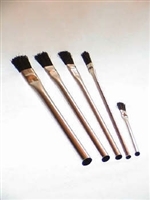 An all-horsehair, tin handle "acid" brush. Use for glue, paste, solder or acid applications. Very popular for jobs where one time usage is necessary. Horsehair bristles staple-secured, double crimped. Standard pack consists of 144 pieces.